Sew Slowly: An end in sight - definitely! Today's task, hand sewing as usual for Slow Sunday Stitching, is to finish attaching the backing to the denim. I've used some lengths of flannel so the back will be nice and soft, toyed with the idea of adding wadding to make it the world's heaviest quilt, but decided against it, and just machined around three sides, right sides together. So now I'm pulling it right way round and doing the last side by hand. I considered machining half and then hand stitching the last bit, but a) it is pretty bulky and b) this is the edge with the kind of stepped bit and I want to do that by hand. If I get that done, I have the next quilt ready to go in the hoop. I'm still working in chronological order, so it's Build Me a Wall's turn now. Use it up... make it do.. do without... the life of a Scrappy quilter who uses parts of jeans... some inventive embroidery.. to produce a useful, attractive quilt. That will be one heavy quilt for sure! Your work with denim has inspired me to take on a mending repair with coloured threads. Hope to get at it some time soon! Such lovely stitching. This quilt is going to be a stunner! I'm looking forward to the finish photo! The stitching is glorious. Oh Kaja, not you too - another quilt finished and it's still only (just) January!!! I'm crying here...will I ever get anything done?! I LOVE the look of that soft flannel on the back. You definitely made the right decision to go waddingless! It would indeed be heavy, but I can't imagine trying to hand quilt through three layers like that, your fingers would be worn to the bone. Can't wait to see the finish! I love the backing fabric - this will be a real winter warmer! 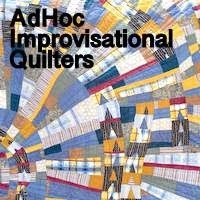 I don't know what it is about this quilt, but it brings me joy just looking at the pictures. You can see that there is love in every stitch. Even if it takes her 3 years!